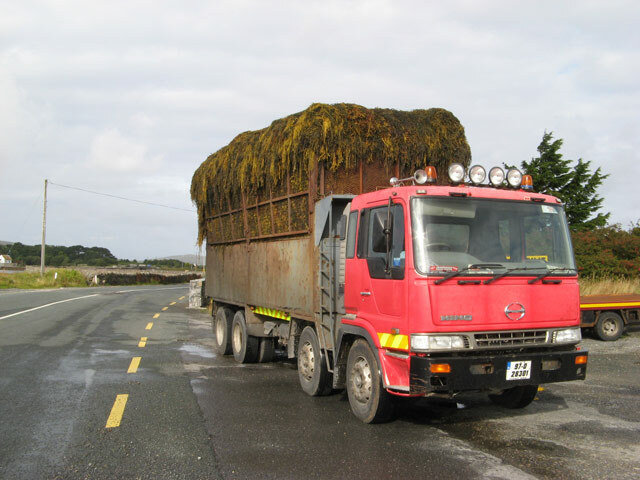 I was lucky to catch this image of a lorry loaded with seaweed destined for the factory at Kilkieran L8431 : Seaweed factory. The lorry had parked up while the driver was ferried back to collect the companion wagon with its hydraulic grab used to pick up the baled seaweed (Knotted wrack - Ascophyllum nodosum) from collecting points such as L9230 : Slipway and seaweed. Several tens of thousands of tons of seaweed are collected annually, but the low density of the wet seaweed means that a high cage is added to the tipper body to ensure an economic payload. The lorry is a Hino, built in Japan. © Copyright Jonathan Wilkins and licensed for reuse under this Creative Commons Licence. This page has been viewed about 703 times.